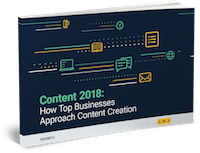 Content 2018: How Top Businesses Approach Content Creation is the result of a survey that Acrolinx conducted with 250+ content professionals from around the world. We wanted to better understand their content creation practices, goals, and challenges. The report is loaded with insightful data and takeaways. It also includes recommendations every content professional should be considering for their own content operations. Acrolinx helps the world's most recognized brands produce great content with the only AI platform for Enterprise Content Creation.